The Cleat Marking Pens are an essential tool to make sure that you denote the "before" position of cleats prior to adjusting them. The Cleat Marking Pens are an essential tool to make sure that you denote the "before" position of cleats prior to adjusting them. Without the pins, many fitters have discovered that once the cleat is loose its too late because all reference points are lost. 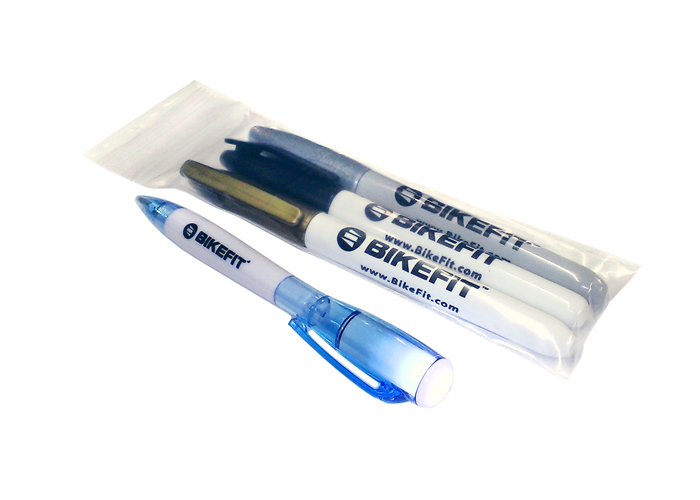 Based on years of fits BikeFit's Cleat Marking Pens come in 3 colors - black, silver & gold [which you use depends upon the color of the shoe sole]. Once you've marked the cleat's original starting position, you can use the other two pens to make before and after marks on the shoes to see changes.